I'm new here...just joined today. I bought and read Shannon's great book, and I feel energized to replicate her success. I posted an announcement (on Facebook and to my email list) that was worded pretty much exactly the way Shannon wrote about in the introduction of her book (plagiarism, anyone? ), and I got a tepid response. I was a little nervous to put it out there, but I did it anyway (yesterday), and now I'm waiting to hear back. I got three invitations: one in Nashville, one in Asheville (isn't that funny?) and one in Naples, Florida. The North Carolina date would be in 2020, so I won't be able to tie that in this year. I'd love to hear others' experiences with recruiting hosts. Did it seem like a rush or a trickle? Did the trickle turn into a rush, or did it peter out? And, if the reception wasn't exactly enthusiastic, what did you do to not be intrusive but still keep the offer out there? Any stories you have to tell, like things you wish you knew when you were first getting started? Hi Marji! Welcome to our community! I wanted you to know that when I first started putting the word out there about doing house concerts, it was also a trickle for me. Since we were using them at first as filler dates for my club touring, it worked out alright, because we weren't relying solely on the house concerts to create a tour. People started to take notice more as we started doing more house concerts, even the trickle we were doing at the beginning. I think people are pretty visual, so when we started posting photos or videos of house concerts we'd done, more people began to pay attention to what we were doing. I encourage you to start with the requests you've gotten — and if you know you'll be planning a tour with a few seed dates, perhaps you could make a more explicit post to people in the regions through which you'll be traveling to ask if anyone would like to host there. 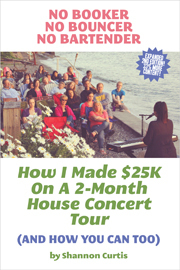 For some people, an open-ended request is too much to take on, whereas "I'm looking for a house concert host in (this region) on (these potential dates)" might feel more accessible to them. As you do your first shows, document them, and post about the experience. You're just starting to tell your story, and it'll definitely take people some time to catch on to the thing you're doing, be wooed in, and hopefully ultimately decide they'd like to experience it for themselves. I got an email from a potential host last year who said something along the lines of, "Ok, I've been watching you do your house concerts on Facebook for like 3 years, and I think I'm finally ready to host a concert. How do we do it?"